At a time when the Ford Motor Company seemed to be concentrating most of its efforts on trucks and SUV's, it came to the realization that it was perhaps overlooking the full size sedan market. 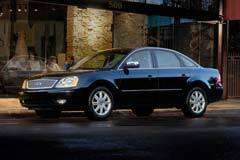 So, in 2005, the Ford Five Hundred made a relatively brief three year appearance. Eventually this car would become the rebirth of the Taurus. Buying a used Ford Five Hundred is all about the space. This automobile provides a full 40 inches of legroom in both the front and rear interior quarters. It has a 21 cubic foot trunk in back. With a nod to the SUV market, the front seats were even positioned higher than that of a normal sedan of this size for better viewing of the road ahead. A used Ford Five Hundred may be available in 3 trim levels, the top of the line Limited, the SEL or the SE. All models were front wheel drive and an all wheel drive version was optional. The engine was a 3.0L, Duratec 6 cylinder, 203 horsepower paired with a 6 speed automatic transmission. If you are considering the purchase of a pre-owned SUV or full size family sedan, a used Ford Five Hundred is well worth your consideration.